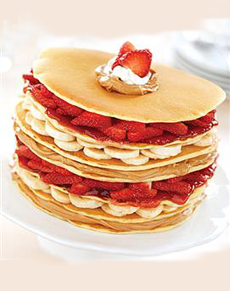 Enjoy this special occasion pancake stack for Valentine’s Day, Mother’s Day or other occasion when taking the extra step makes a big hit with family and guests. The pancake “cake” is sliced into six wedges. Prep time is 15 minutes, cook time is 30 minutes. Thanks to Hungry Jack Pancakes for the recipe. *This recipe used Jif Whips Whipped Creamy Peanut Butter. 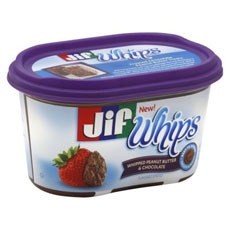 We wanted to add a touch of chocolate, so used the companion product, Jif Whipped Peanut Butter & Chocolate Flavored Spread. and this chocolate peanut butter spread. 2. STIR pancake mix, milk, oil and eggs in large bowl until smooth. Let stand 3 minutes. 3. COAT a griddle or large skillet with no-stick cooking spray. Heat over medium-high heat (375°). Make 7 large pancakes, seven inches in diameter, in batches, by pouring a scant 1/2 cup batter for each pancake onto hot griddle to form 7-inch circle. Cook until bubbles appear and edges are dry, about 1 to 1-1/2 minutes. Turn and cook an additional 1 minute or until golden brown. 4. PLACE 1 pancake on oven-safe serving plate; spread with 1/3 cup peanut butter. Top with another pancake. Completely cover surface with banana slices. Top with third pancake; spread with 1/4 cup strawberry jam. Completely cover surface with 1 cup sliced strawberries, mounding strawberries near outside edge. Repeat all layers. Top with remaining pancake. Cover with foil. 5. BAKE 5 to 10 minutes or until heated through. Insert 6 decorative wooden skewers into stack-up, if desired, to secure each wedge. Cut into wedges. Garnish with whipped topping, if desired. Serve with syrup.